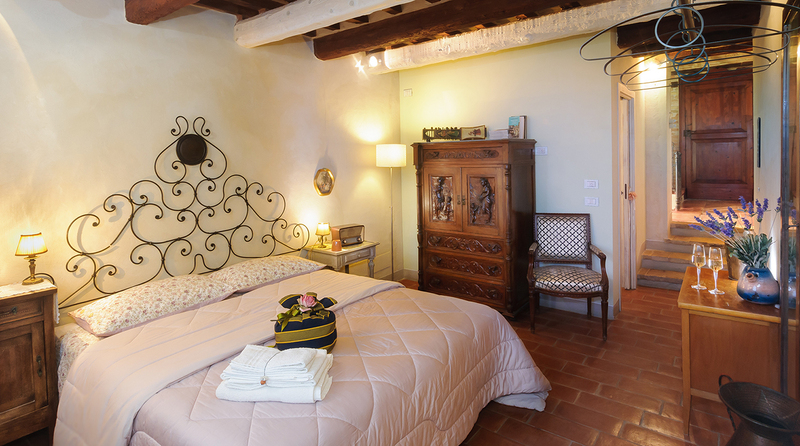 The Paolo and Francesca room is ideal for those who prefer a private and romantic stay. 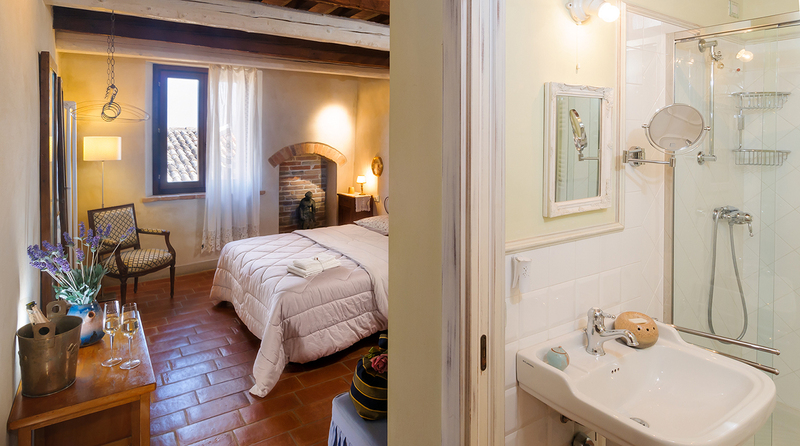 The Paolo and Francesca room is a comfortable and bright master bedroom facing East on the first floor of the B&B Pomarancio. This room is romantic both in its name and in the atmosphere of the space: we chose the Bellora linens for the bed, which is also wrapped in a soft mosquito net that covers but doesn’t hide its beautiful handcrafted wrought iron headboard; on the right hand side of the bed, a nook in the wall discovered during our recent renovation, holds a small statue of Venus, graciously wrapped in drapery. The curtains are embroidered by hand, and the windows facing East carry the breeze from the sea and its unmistakable scent. In the valley that extends below, from the hills all the way to the coast, the ancient medieval town of Gradara rises in the distance, home to the tragic 14th century love story between Paolo and Francesca, which Dante made immortal in his Divine Comedy: for a romantic holiday, you must treat yourself to a walk arm in arm along the walls of the Rocca dell’Amore, (Fortress of Love), and a stay in our B&B near San Marino and its surroundings. 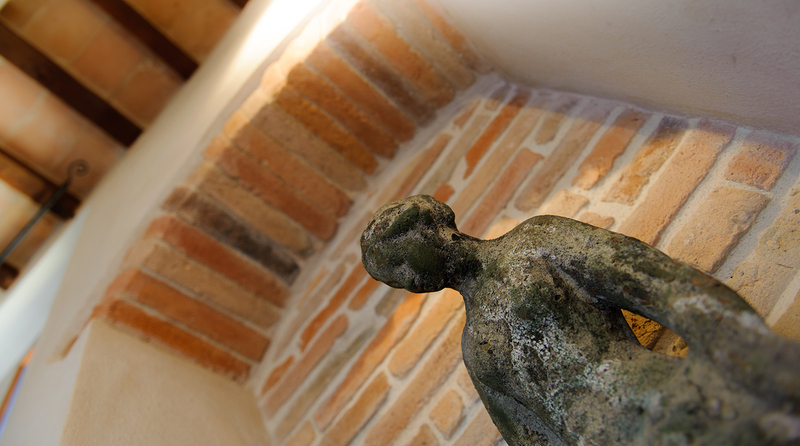 A romantic holiday in a bed and breakfast on the Rimini hills. The room has a handmade cotto tile floor and a wooden ceiling truss, made once again visible to the eye by recent renovations. The alternation between the old ceiling beams in darker wood and the new beams in lighter wood give a sense of airiness and brightness to the space. 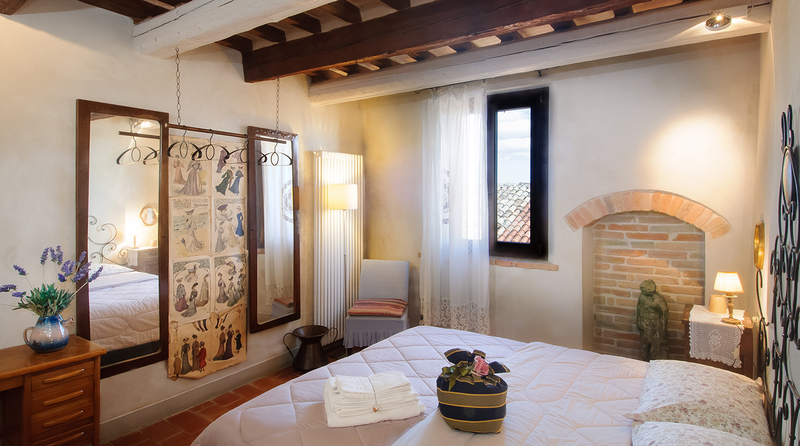 We are extremely detail oriented and want our guests to feel at home, but with a taste of originality meant to amuse and surprise: in the Paolo and Francesca room, you will not find a closed bulky closet, but a clothing rod secured to the ceiling beams through small chains. 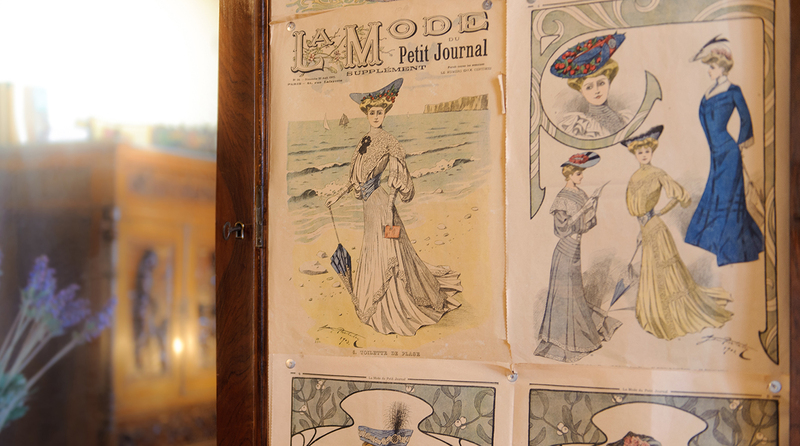 The rod is delimited by two wall mirrors, and between them, a series of pages from old Parisian fashion magazines of the early 1900s, joyfully remind us of the vanities of the past. A wooden wardrobe by the bed, embellished with scenes of sea, fishing, harvest and countryside life, has ample drawers and doors with a small mirror inside of feminine and reserved taste. The fabric of the linens in the private bathroom reflects the local tradition in embroidery and the use of natural linen. The bathroom is equipped with organic soaps and a hairdryer. In the room there is a mini bar, free Wi-Fi, a variety of books, a working transistor radio from the 50s, and objects of contemporary art. 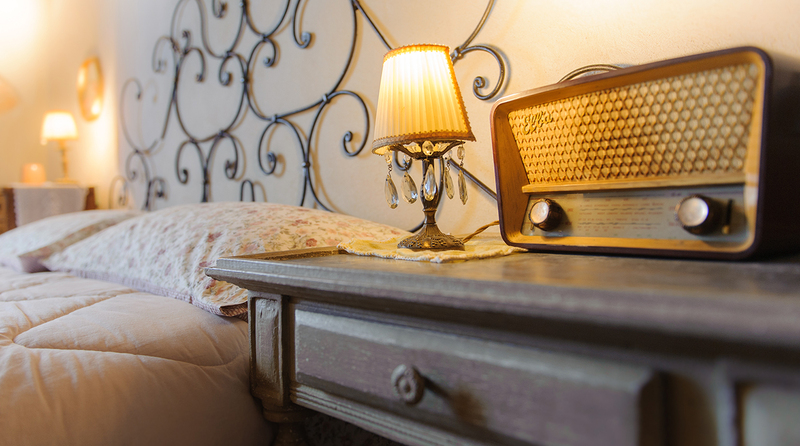 The pleasure of the room’s comfort is matched by its vintage style. The room is cleaned every day, and our hospitality is also renewed daily: every evening you will return to your room to find seasonal fruit or finger food: small homemade pastries, a taste of cheese, or whatever the local farmers have to offer in that particular season.